Donna Smith’s habit of buying a lotto ticket on her birthday and whenever she has a holiday proved lucky. She returned from a holiday in Corfu a millionaire. When she asked friends to check the ticket it gave a message saying she needed to call Camelot. She walked home to find she had won a million pounds. The lucky woman says she plans to buy houses for her, her mother and her daughter. 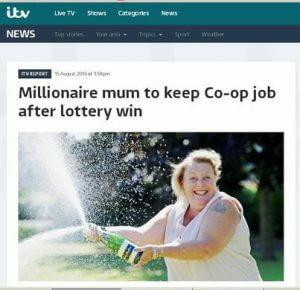 She has no intention of quitting her job at the co-op.